Thursday arrived a little early, but, after informing the car-rental agency of the change in plans, we enjoyed the unexpected extra day in Madrid. We visited more museums and more outdoor cafés, and then we took the metro to the airport. The kids arrived around 7:30 p.m. without further mishap—and so did their luggage, which included two large hard-sided suitcases, two smaller suitcases, and a folding “umbrella” stroller. We had reserved a rental car through a discount brokerage based in the Greek Islands. The rental-car agency they booked us with didn’t have an office at the airport, so our instructions were to wait for the agency representative at the concourse rental-car area. So wait we did. And wait. And wait. Half an hour later, we called. Where were they? We were greeted with rapid-fire Spanish and then they hung up. We called again. And again, talking to someone different each time. We opened the trunk and tried to fit in two of the kids’ hard-sided suitcases. They wouldn’t fit. More discussion followed. Was there another car we could upgrade to? The rep shook his head. This was it. Oh, and by the way, he indicated, pointing to a beat-up car parked nearby with the driver’s window open a crack, that was where we were supposed to leave the keys when we returned the car. We looked at him with disbelief. No way were we going to return the rental car without having it checked over first by a rep. After all, we didn’t want to be held responsible for damage that might occur after we parked the car. More discussion followed, and he called in reinforcements. The agency manager arrived, looking much put out, and informed us that since it was now after 10 p.m., it was this car or no car. They had no access to other cars after their “office” was closed. After additional nasty exchanges, we cancelled the contract and headed back to the rental car area in the concourse. We were sure we could do better. We were wrong. This was, after all, Thursday evening of Holy Week in Spain, and all rental cars of any size at the airport were already reserved. Sorry. By now it was 11 p.m. and our merry band was anything but. 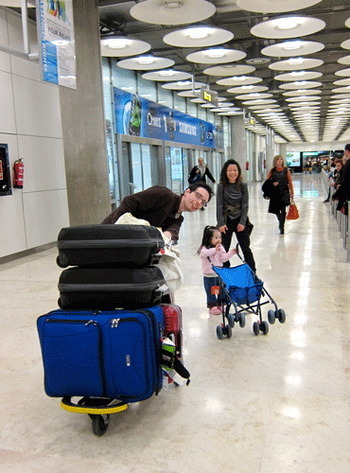 We were stranded at the Madrid airport without a rental car. Desperate, we called the hotel where we had stayed the night before. They had (only) two rooms left. We reserved them and went out to get a taxi. Or two. It turned out that no taxi in the queue was large enough for four people and six (our two plus their four) suitcases and a baby stroller. We split up. Gary took one taxi and four suitcases. He drove off while Jesse, Yui, Sophie, and I started to get into another taxi. The taxi driver began loading our suitcases into the trunk, but then he changed his mind. He refused to take us without a child car seat. Since we had reserved one with the rental car, the kids hadn’t brought one with them. More discussion. Suddenly the taxi driver dumped the suitcases out of the trunk and sped off, leaving us standing at the curb. Another driver pulled up and we started the process again, this time with more success. About half an hour later, I had arrived with the kids at the hotel but Gary hadn’t. At last he showed up down the street, wearily dragging the four suitcases as best he could. His taxi driver hadn’t been able to figure out how to reach the hotel and had let him off at a nearby corner. But he had arrived, and he had the suitcases, and the kids were happy with their room, and all that was left was to figure out how to get a rental car the next day to drive to Sahagún. Oh—and to cancel the rooms (already paid for) at the hotel in Segovia. Somewhat bedraggled, we got up early the next morning, “a day late and a dollar (or several) short.” We took two taxis to the nearby train station, picked up the rental van, and drove without further misadventure to Sahagún. Jesse did, in fact, manage to connect with six of his school friends. We even arrived in time to see one of the Semana Santa processions, complete with a bloody, articulated statue of Christ being laid to rest in a glass-sided coffin. The rest of the two-week trip (to Girona, Barcelona, and back to Madrid) went with very few hitches. Maybe all the dominoes had toppled on the first day. Although we got tired, our charming granddaughter had the time of her young life. Sophie learned to say “Hola” and enjoyed interacting with friendly Spaniards. She also figured out how to defeat the security system in the Royal Palace in Madrid. She started to toss her sandals under the “do not enter” cordon at the doorway to one of the rooms; her plan was to run in after them and retrieve them. Her parents grabbed her just in time. We had a wonderful visit with our family, and we learned a few lessons to follow in order to avoid “the domino effect” the next time. 1. Always have a backup plan. Or two. Or three. 2. Prepare for the worst but hope for the best. 3. If it doesn’t feel right, don’t do it. 5. Never give up, no matter how much provocation. 6. Always rent from a car company with plenty of cars and numerous offices. You may need them. 7. Always rent a larger car than you think you need, especially if you are traveling with kids (think: diaper bag, stroller, extra luggage, etc.). 8. Always try to have access to the Internet and a credit card. 9. Always remember the reason why you are traveling together: to enjoy each other’s company and have a good time. The rest is just so much static.